A hidden gem, would be the only way to describe Kateh - mainly because it is actually quite hidden. Tucked away on a quiet tiny street just off the canal in Little Venice and next door to my favourite local pub (The Warwick Castle), it’s barely visible unless you know it’s there. 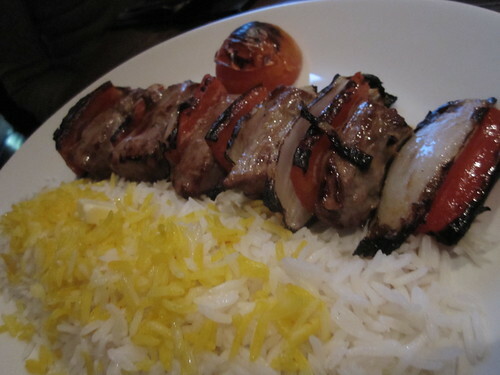 Kateh promises authentic Persian cuisine and ‘service of the highest standard’ in a ‘warm and relaxed’, and I’m happy to say they delivered on all fronts. Though converted from a typical Madia Vale mansion, the restaurant is tiny – only 75 covers – which unfortunately makes it a bit noisy during the dinner rush. We contributed with the ‘Oohs’ and ‘Aahs’ of delight with our meals. Great, meaty ‘grow hair on your chest’ olives, is more like it! Absolutely brilliantly paired with a walnut paste, which was more the consistency of a pesto, and a sprinkle of pomegranate seeds for a bit of zesty sweetness. Definitely my favourite dish of the night. 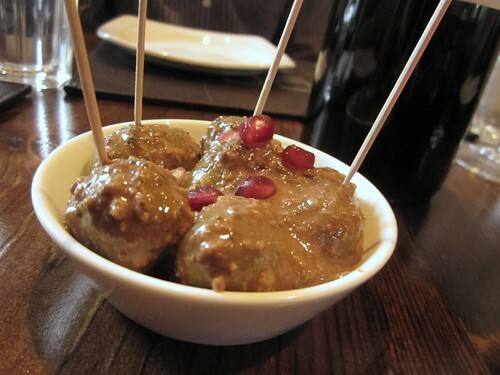 Delicious Persian meat balls with a lovely surprise centre of plums. 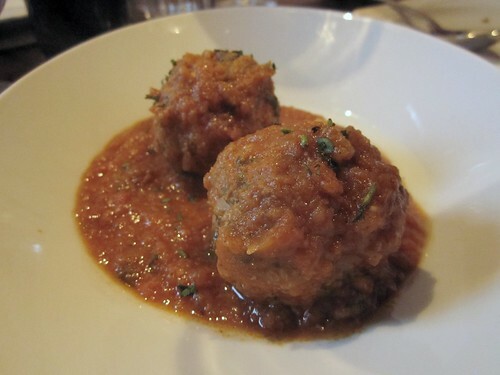 I’ve never had a meatball that melted in my mouth – It was incredible. Although slightly overcooked, the garlic, peppers and slightly citrus-y sauce made it a winner. On to the mains, and my only complaint is a lack of variety. Each dish in the ‘meat’ section looked strikingly similar. 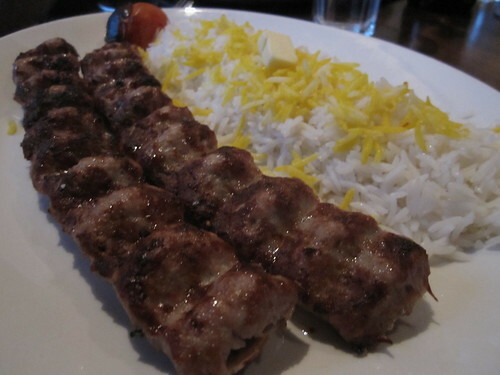 Generally, a skewer of lamb with rice and only a slight difference in how it was prepared. Amazingly tender, which I always consider a feat when grilled on a skewer considering the size of the pieces. The kitchen clearly had a grasp on cooking times. The marinade, with spices I could quite put my finger on, was a perfect balance of rich salty and sweet. 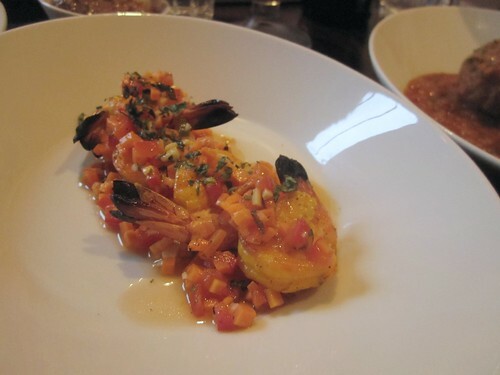 However, the saffron rice, as you can see above, was a bit of a cheat being a quarter saffron and three-quarters regular. Anything minced and grilled is bound to be a bit more tough, so I’m definitely glad I went with what I did. Still, the spices were spot on. 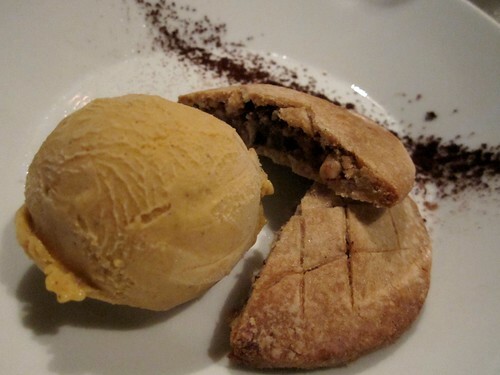 Continuing with the sweet fruit/rich nut theme I found in my starter, we were presented with a warm date and walnut cookie with homemade cinnamon ice-cream, which I can confidently say is the best dessert I’ve had all year. It’s reason enough to make the journey to Maida Vale . 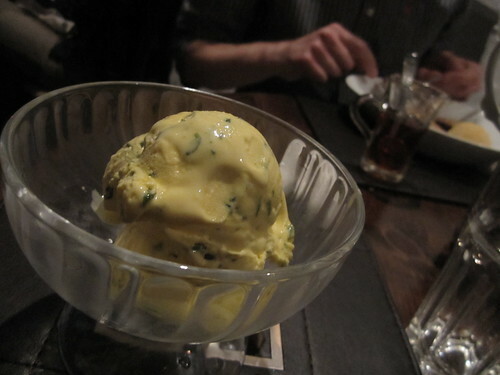 The Persian Saffron Ice Cream (£ 4.00) was also lovely, though it couldn’t hold a candle to the cookies.